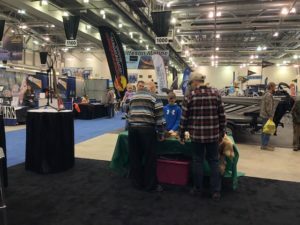 This past weekend, Shaun McKeon, Morgan Warda, and I were at the Ultimate Sport Show in Grand Rapids from Thursday, March 14th to Sunday, March 17th. This sports show and many others like it, that MUCC staff attend, are produced by ShowSpan. This show marks my first time ever being behind a vendor booth or even attending a show at this magnitude. Being that it was my first, I was amazed at how much was there. The show offered seminars on hunting and fishing tactics as well as put on display some of the best taxidermy and wood carvings I had ever seen. Thursday and Sunday were among some of the slower days for the show but Friday and Saturday did not disappoint. Devos Place was packed with vendor booths, a trout pond, and a performance pool for shows and demos. If you are into recreational activities in the outdoors, then these shows were meant for you. People came from all over to look for new fishing poles, book a fishing or hunting guide, chat with the DNR or other like-minded conservation clubs and organizations like MUCC. Shaun, Morgan and I had a great time chatting with the people who visited the booth and when they left, they hardly left empty-handed. 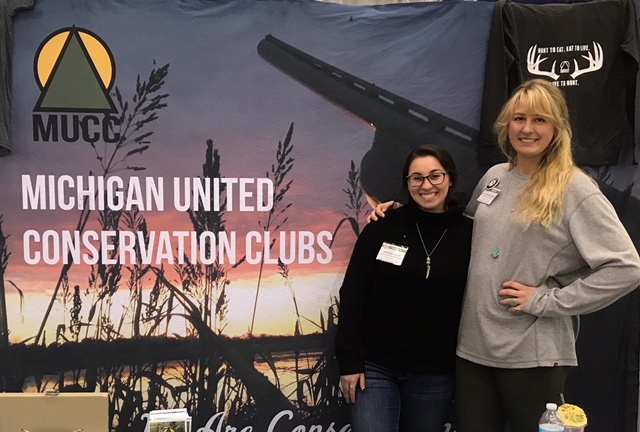 We provided; flyers for AmeriCorps and all MUCC programs, taxidermy birds, fur pelts, TRACKS magazines, a Michigan’s wildlife cooperatives map, MUCC merchandise, Michigan’s Out-of-Doors magazines, and calendars. 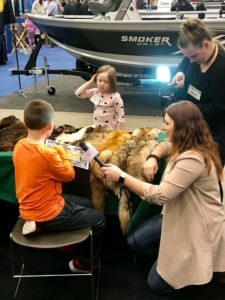 Our display of fur pelts was a big hit with the kids and Michigan’s Out-of-Doors magazine was an attention grabber for the adults. We had people come to visit us simply because they knew of MUCC and wanted to chat and renew their membership. I had several people recognize my position with AmeriCorps and wanted to learn more about it. For one example, on my way to get Dippin’ Dots (tasty ice cream treat), the vendor recognized the AmeriCorps “A” on my chest and expressed that her son was in AmeriCorps and wanted to learn more about who I was serving with. MUCC had several volunteers throughout the weekend come and volunteer their time at the booth. The show can get busy and it is very helpful to have volunteers alongside staff there to engage with the public about MUCC. I know that I can speak for all of MUCC staff when I say thank you to all of our volunteers throughout the show season. One of our younger volunteers was asked to give an interview, he accepted and chose to share his passion for the Out-Of-Doors Youth Camp and TRACKS magazine. Being a part of an organization, like MUCC and Huron Pines AmeriCorps, that cares about outreach and conservation is something I appreciate very much. The show was a great opportunity to chat with the public about what Huron Pines AmeriCorps and MUCC stand for. We received comments such as, “Happy to see you (MUCC) here” and “MUCC is a great organization.” That was a wrap on outreach for consumer shows, until next year!